Providing a scalable power solution for a new data center that needed to combine outstanding energy efficiency with the highest possible levels of resilience. Power Xpert 9395P UPS featuring the Energy Saver System (ESS) for maximum energy efficiency and HotSync for easy expansion, supported by Eaton’s low-voltage distribution switchgear using Eaton TABULA systems. The Eaton UPS system and the associated low-voltage distribution switchgear proved easy to install and commission and the solution has now been operating for more than nine months. 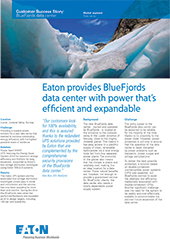 During this time the BlueFjords data center has performed flawlessly and exceeded all of its design targets, including 100 per cent availability. Since the commissioning of the BlueFjords data center, the power systems have operated exactly as planned. Their high efficiency is helping BlueFjords to minimize energy costs and the environmental impact of its operations. At the same time, their outstanding reliability and power protection performance are ensuring continuity of service and total data security for the company’s customers.